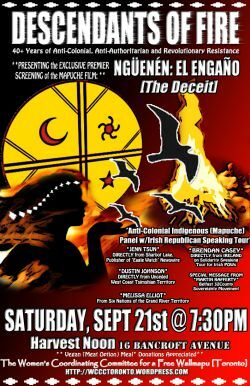 "Ngüenén: El Engaño" [The Deceit] (2012) – with English Subtitles. This September 11th marks the 40th anniversary of the Coup d’état in Chile and with it the memory of a brutal dictatorship, the commemoration of the many thousands of missing, murdered and exiled victims by the Chilean State, with the implementation of the Shock Doctrine known as the neoliberal economic model we live in today. However, the victims of State repression go far beyond the period of the Pinochet dictatorship in Chile. We must also recognize the ongoing plunder and criminalization of the most marginalized sectors of our society by those in power, the later hunt for the revolutionary movements that were born in response to these injustices, and especially the ongoing genocide of indigenous peoples on their ancient territory. The Mapuche Peoples are a living and fighting example of how an indigenous Nation has been able to resist for more than 400 years against ongoing colonial, corporate and State interests that invade their territory, which continues to this day. These ongoing struggles for Land and Liberation are not only seen in Wallmapu or Chile, but also across this stolen continent, here in Turtle Island and around the world, as they are the response to a genocidal colonial capitalist system. For the Reclamation, Reconstruction and Liberation of Our Mapuche and Indigenous Nations! FREE ALL IRISH REPUBLICAN POWs! IF ONE FALLS – TEN SHALL RISE UP!! A documentary made by the directors of “El Despojo” (The Plunder) focusing on the international political dynamics of the “War on Terror,” and the counterintelligence strategies used to criminalize the Mapuche struggle for Autonomy and Territorial Reclamation. Chilean Prosecutor, Mario Elgueta, whom was the alleged victim of an annihilating attack in southern Chile, was actually a student in an FBI [and CSIS] antiterrorist course in Virginia USA. Through the techniques of a judicial/political/media setup, 17 Mapuche land defenders faced trial under the Antiterrorist Law, at first risking a total of up to 800 years in prison… Four bicentennials on the backs of those who oppose the arrogance of the Chilean State. JENN TSUN - unaffiliated Anishnaabe/Ongwehonweh/Anglo-Pictish/Slavic Grandmother, born Toronto, living near Sharbot Lake; Defender of Indigenous Sovereignty & Self Determination, AntiImperialist; Publisher of Eagle Watch with nom de plume, Kittoh; Writer, Researcher, Storyteller, Horticulturist, Gatherer, Herbalist, Weaver. Ancestors are with us. Walking the Good Red Road. DUSTIN JOHNSON -Tsimshian born and raised on the northwest coast in non-surrendered, unceded Tsimshian territory. He has done genealogical research, language revitalization, youth advocacy, urban social justice organizing, was the editor of the uncensored Redwire Native Youth Magazine, organized with Indigenous resistant movements against the expanding beast of the Alberta Tar Sands, was a co-founder of the Tsimshian Guardians youth initiative, loves canoeing, fishing, hunting and mountain-climbing. Dustin is a non-conformist and is proud to not be a 'nipster,' which is a native hipster. MELISSA ELLIOT - Co-founder of Young Onkwehonwe United, and a youth activist from the Haudenosaunee Territory of Six Nations. Known to most as Missy, she has organized to defend Kanonhstaton (the former Douglas Creek Estates), and to stop development projects on Six Nations territory being pushed through without their consent such as the Line 9 reversal project. **VIVIANA AVILA (WCCC Toronto) - Founder of the Women's Coordinating Committee for a Free Wallmapu. On the significance of the last 40 years of revolutionary and anti-colonial struggle in Wallmapu, Chile and beyond the Andes. BRENDAN CASEY – Independent Socialist Irish Republican to speak on the conditions of Irish Prisoners of War (POWs) and on the current situation of Human Rights in Northern Ireland. Born into a staunchly Republican family where a significant number of his elders were either POWs or ex-POWs, he has been involved all his adult life in raising funds and publicizing the plight of the POWs. The hunger strikes left a lasting impact on him. He was the chairman of the Ballyshannon Bundoran hunger strike march for a number of years and now classes himself as an independent socialist Republican. In this capacity he would be travelling to Canada as well as other countries to try to give people a true picture of the POW situation in Ireland.